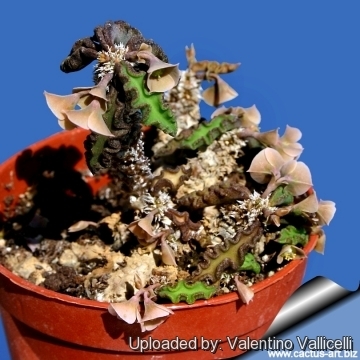 It is surely a bizarre Euphorbia, and has some really unusual thick, wrinkled leaves. A special plant indeed! Origin and Habitat: Endemic to Madagascar. 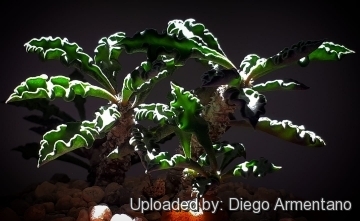 Description: Euphorbia decaryi is a small, perennial, leafy succulent with a shrub-like development and beautiful wavy, zig-zag edged leaves. It is a mat-forming species and spreads almost horizontally on the ground by means of rhizomes. 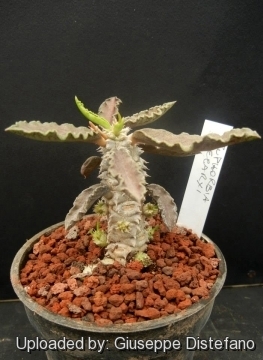 The Euphorbia decaryi growth form illustrates the typical horizontal habit of most Madagascan euphorbias. It is one of the most popular and widely grown of the Madagascan euphorbias. 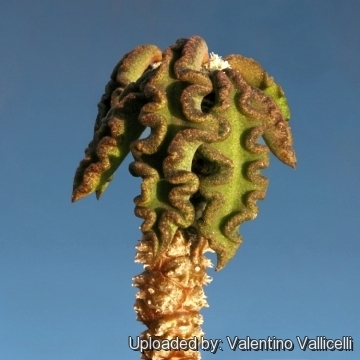 Stem: Succulent, long, irregular, corky, root-like partially subterranean, not very thick around, more or less angled and spiralled covered with scale-like leaves. Above ground the stems are erect or creeping. Leaves: Evergreen or semi-deciduous, tufted in rosettes at the stems tips, deep-red and green coloured, narrow, very succulent, highly undulate, folded and crisp with raised veins and very attractive. Leaves in summer and under stress assume a nice coppery-bronze colouring. Flowers: Hanging like small bells. Cyathia yellow in short-stemmed groups with beige, soft tan or pinkish petal-like cyathophylls (Coloured bracts around the cyathium). Remarks: This is a variable species and there is a lot of confusion caused by the several horticultural forms that have popped up in the trade over the years. 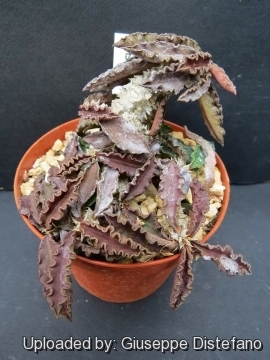 Euphorbia decaryi var. spirosticha Rauh & Buchloh: smaller and slow growing than Euphorbia decaryi. 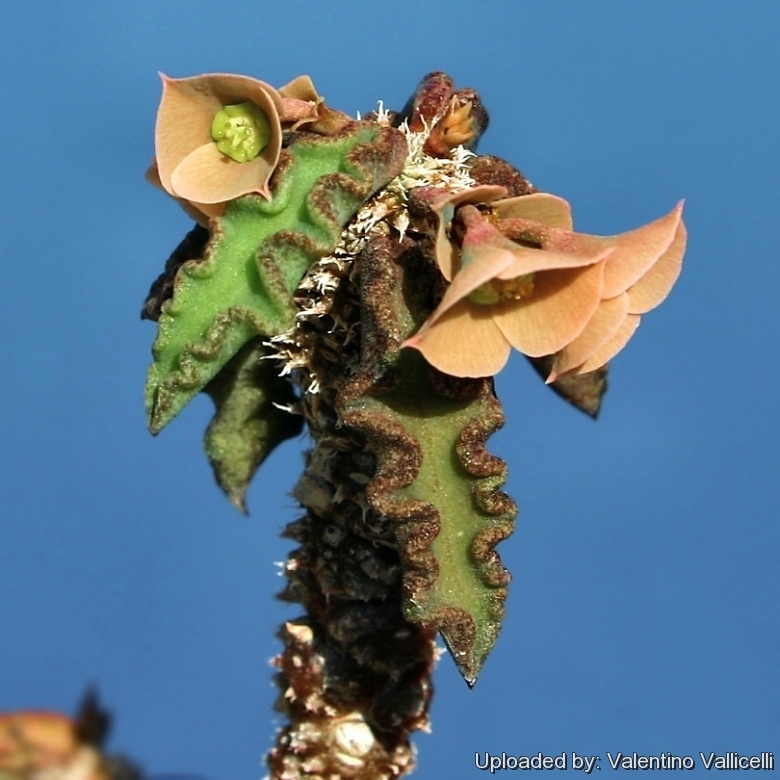 Cultivation and Propagation: Euphorbia decaryi is a very unusual plant and one of those that turn out to be difficult if treated as a difficult plant and kept too dry. They are indeed easy to cultivate and quite effective in a small bonsai pot. Growth rate: It forms a dense mat of tangled stems creating a very nice specimen in just a few years. Growing medium: Use a very draining loose compost which mainly consists of non organic material such us clay, pumice, lava grit, and only a little peat or leaf-mould, and place the plant in a wide flat bowl. Repotting: Re-pot every 2-4 years. If the plant remains dormant after repotting, you can rouse it with a shock (first you have to wait about two weeks after repotting to let all wounds heal.) Water it with hot water (40 to 50°C). Healthy plants usually react within 2 to 7 days. Fertilization: Need a perfect fertilizer diet in summer. Use preferably a cacti and succulents fertilizer with high potassium content including all micro nutrients and trace elements or slow release fertilizer. Watering: In the heat of summer the plant needs a good amount of water. Even in winter its soil should never completely dry out. Though it tolerates a dry over-wintering, it then gets in trouble in spring when it has to produce new roots. Care must be given in watering, keeping them warm and wet while growing, and cooler and dry when dormant. Exposure: These plants don't seem to love being blasted by the sun in the summer but prefer bright light, and will therefore not make demands on your prime growing space.However shade grown plants will tend to produce fewer, and etiolated growth (weak, gangly stems with unusually long internodes, and generally paler green coloration). The colour of this plant is much more marked if grown in full sun. Temperature: The ideal temperature in summer is about 25° C; in winter above 15°C. They can grow both in pots and in the ground in areas with mild climate, but they can even be grown indoors. Reported as cold sensitive they can indeed survive outdoors, where they proved to be able to take some light frost with minimal damage. Rot: Rot is only a minor problem with Euphorbias if the plants are watered and “aired” correctly. If they are not, fungicides won't help all that much. It is very unlikely to lose this plant from root rot from excessive water. Maintenance: Trim off the dead 'arms'. 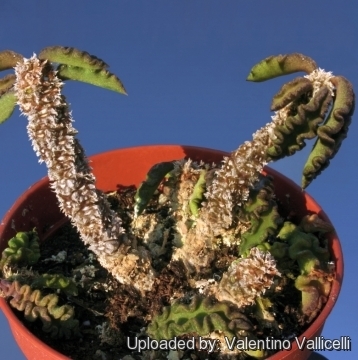 Warning: Like all Euphorbia HANDLE WITH CARE, the latex/sap is dangerous and can cause skin rash, itching and general discomfort. Propagation: Seeds or (usually) or cuttings. The seed will loose viability in storage, and may not be viable the following year, so the seed should be planted as soon after harvesting as possible. Germination usually occurs within about a week or two. First of all if you remove an offset, you have to wait about two weeks before repotting to let all wounds heal (cuttings planted too soon easily rot before they can grow roots). It is better to wash the cut to remove the latex. Place the cutting in a warm, bright (w/o direct sun) and slightly humid spot, to increase the building of new roots.